Our hand-hewn log cabin makes for a very unique getaway. Built only recently, it is nestled in the hills on 2 acres with an abundance of tree cover. There are very few neighbors, none of which are visible from the property. It is very peaceful and there is no road noise to be heard...just nature! The front of the home has two large covered decks which you can enjoy in all weather types. The smaller side deck is perfect for grilling and sunning. The landscaping is simple, yet aesthetically pleasing. The inside is open and cozy. The master bedroom with its king bed is located on the main floor. The kitchen and the living room are adjoined and the living room's vaulted ceiling looks up to the open loft, which is a queen-sized bedroom. There is a finished basement which contains a game room/pool table and the second queen bedroom. The basement walks out to the lower deck and the hot tub. The interior is all wood and comfortably adorned with old-fashioned relics. We also have a large fenced-in yard, so bring your dogs and enjoy this mountain sanctuary! For a simple and personalized booking experience, contact owner and get your best deal!!!! The basement bath has new custom shower. full size couch love seat and lazy boy. We enjoyed our family getaway. The pool table was a huge hit with the kids. We also enjoyed the hot tub after our long hikes! Beds were very comfortable. The cabin is beautiful! Private and peaceful! Very roomy and cozy! Super comfortable couch and beds! Clean and well stocked! Very well maintained!! There’s a fenced in back yard for dogs! Which is very convenient! The couple is super nice and easy to contact! They respond within minutes of email! We stayed for Christmas and the owners were super sweet letting me know what decorations they had put out so I could decide what decorations I would want to bring of my own! Great price! Absolutely loved it!! Will be staying here again!! The cabin was very clean, nicely furnished, and had tons of great amenities! 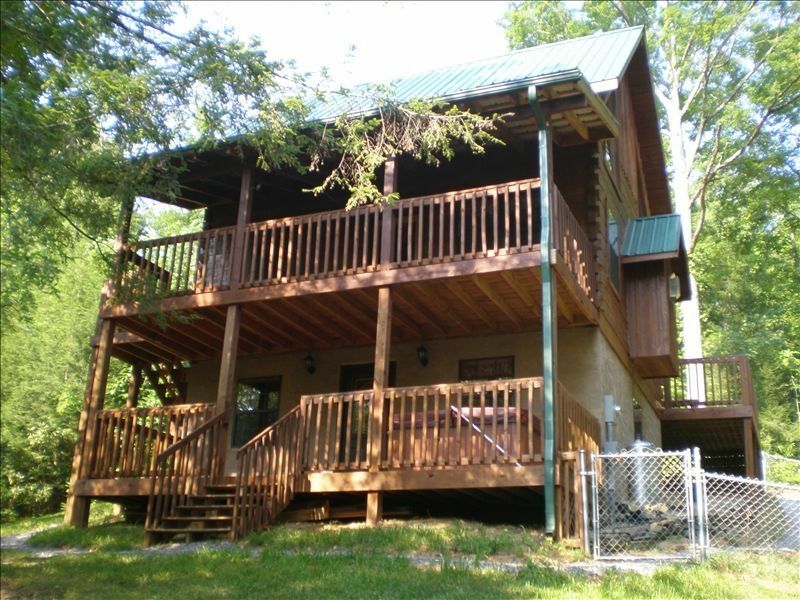 Close to town, only about a 10 min drive to downtown Gatlinburg. Our pups loved running and exploring in the backyard! Mark was very easy to communicate with and we would highly recommend this cabin for a little getaway, nice and private! Beautiful cabin. Will definitely be back. Quiet and peaceful. We all had a great time. Loved the fenced in yard for our dogs. I would recommend this cabin to anyone who wants to get away from the city. The house was more private than expected, but that’s not a bad thing. The charm of this house makes you feel right at home. Our dogs LOVED the fenced in back yard. It was amazing sealed up, our little 5lb Yorkir couldn’t even escape. Only things I would warn of is at night it is DARK, we didn’t leave the house after sunset. And the road to get to the drive way is a little confusing at first, you will think you are going through someone private driveway, and there are chickens!! So drive slow. But all in all I was amazed with this property and the pictures do NO justice. 1. When unloading your luggage, bring it in thru the side porch. 3. Take time to sit on the side porch, on a clear night. The stars are breath taking! 4. I bring extra paper products & laundry soap. 5. Take time to visit the National Park & save money on shopping. You won't be sorry. Our daily rates are based on 4 adults/night. The rate increases by $10 for each additional adult/night; $150-5 adults, $160 6 adults, There is also a $75 cleaning fee. Pet fees are either $35 (35 lbs. and under) or $50 (over 35 lbs). PS Homeaway and VRBO intent Quote our often wrong. So call or email 517-294-4343 for Quote.